Fiat Chrysler Automobiles’ (FCA) flagship dealer Motor Village UK has once again been chosen as the venue for a top art exhibition – this time a celebration of six female artists’ work to celebrate the forthcoming International Women’s Day 2017. 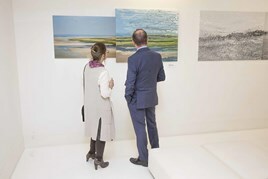 The Wigmore Street, London showroom – usually home to FCA cars such as the Fiat 500S, Alfa Romeo Giulia, Abarth 124 spider and Jeep Grand Cherokee – was converted into a stylish gallery, private viewing and drinks reception to showcase the contemporary art exhibition ‘Kanojo’. The exhibition celebrates the remarkable and tireless life that women experience, cherishing the strength and lightness through an exquisite selection of works. Motor Village UK was chosen because of its central London position and unique design and space. Situated just off the famous Oxford Street, the site was originally created in 2008 with future exhibitions, displays and receptions in the plans, as well as the ability to showcase and sell FCA cars.